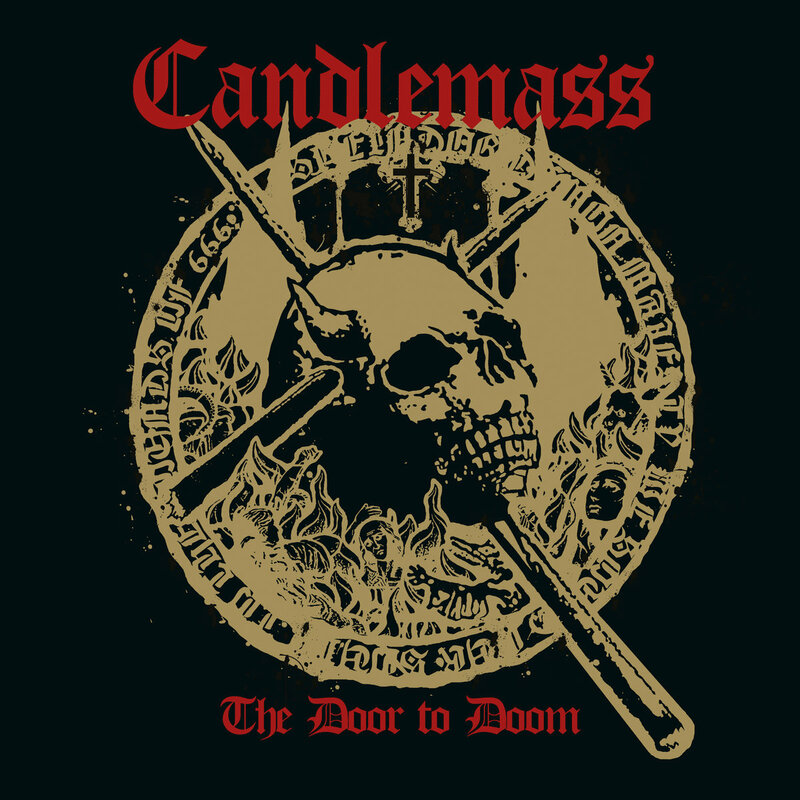 Epic doom legends Candlemass burn both ends to turn out one of their better works in years with original vocalist Johan Längquist. Since I seem to be subsisting almost completely on doom lately, it was only fair I offer some time to Candlemass, the first band that got me into the genre aside from Black Sabbath. Some might say there’s a lot riding on this. Not only is The Door to Doom their first album in seven years, it’s their first album (officially anyway) with their original vocalist, Johan Längquist. He hasn’t appeared on a Candlemass studio album since their very first release, the seminal Epicus Doomicus Metallicus, where he was considered a session (guest) vocalist, not an actual part of the band! It’s been some time coming, but now that the original lineup is more complete than it ever has been since 1986, what is the result? Pretty good! The fact that the album art for The Door to Doom is adorned with the same skull and cross as Epicus Doomicus Metallicus is telling, but it may also be a little misleading. Sure, it can just be a reference to Längquist’s triumphant return to the mic, but I wouldn’t take it as an invitation to critique the two albums side by side. Längquist’s voice is very different – 33 years will do that to you – and better production and more money has only helped clear up the sound of performances all around. This album doesn’t try to hearken back to the days of old, nor should it. Much like The Skull who I also reviewed, this is a mature, journeyed take on doom, informed by years of experience and doing what they do best. I feel compelled to start with “Astorolus – The Great Octopus” because not only is it technically the album’s lead single (“House of Doom” was released first, but as part of an EP in 2018 with then vocalist, Mats Levén), it’s also the best song on the album. It is the epic track on The Door to Doom if there were only one. Monstrous, catchy guitars characterize the song fittingly for something named after a massive, betentacled beast. The bass is rugged and as deep as the ocean’s depths. Längquist’s stately vocals are imbued with low campfire story dramatics during verses, but soar high for the chorus, the apex of which is a spirited ‘Astooooroluuuuus!‘ Tony Iommi (Black Sabbath, but you probably already knew that) contributes a wobbly solo to the track, which means the band has come full circle from performing medleys of Sabbath tracks on their old studio and live albums. The whole track is fun and epic, just how Candlemass should be. Another standout is “Bridge of the Blind”, the forlorn ballad of this album. Längquist issues a heartfelt croon backed up by mostly acoustic guitars, though there is a washy and understated electric solo that moans through the middle of the track. As much as I love the doomed power exhibited elsewhere on this album, “Bridge of the Blind” is perfectly placed in the tracklist as a nice, calming interlude of sorts. Good doom music can also be emotional! But if you’re not about that, you might look to the staunch groove of “Black Trinity”. It’s laid out a lot like an 80s doom song, which is quite appropriate for the Swedish quintet. There are lots of slow, sinister, minor key treats here. It’s also pretty accessible and safe as well; a doom song you may show your dad if you felt so inclined. The Door to Doom only closes on my fingers a couple times with annoyances that are likely subjective to me. “Splendor Demon Majesty”, while solidly riff-driven, is kind of a cringefest lyrically. Then again, I guess the rest of the songs aren’t exactly Shakespearean, so if you’re looking for deep and dark poetics, you might turn to more sophisticated bands. Also, the reusing of “House of Doom”, while a cool song and re-recorded with Längquist, is a sore spot. Did Längquist like the song so much he wanted his own version? We probably won’t ever know, but with only eight tracks here and almost 50 minutes of material, it could have been cut or at least replaced with another worthy, original song. Is The Door to Doom a grand return to form for the godfathers of epic doom? Not really. Is it still a good doom album? Hell yeah. That’s all it had to be. Perhaps the gravity of the situation betrays the simple nature of an old band making another good album, but as cool as is it to hear Johan Längquist back with the group, it really functions more as a delightful easter egg for fans. He’s a very capable singer, and the rest of the band follows suit in putting out one of the stronger albums they’ve done in a couple decades. Candlemass prove above all that they haven’t lost the spark. Previous PostStephen Taranto - "Permanence"